I took a glance at Mr. Mannell's blog, and I saw a post that he left for me! I took some of his photos that he thought was pretty unusual. Click here to see the post if you are interested. This photo of the Tropic of Capricorn is humorous. 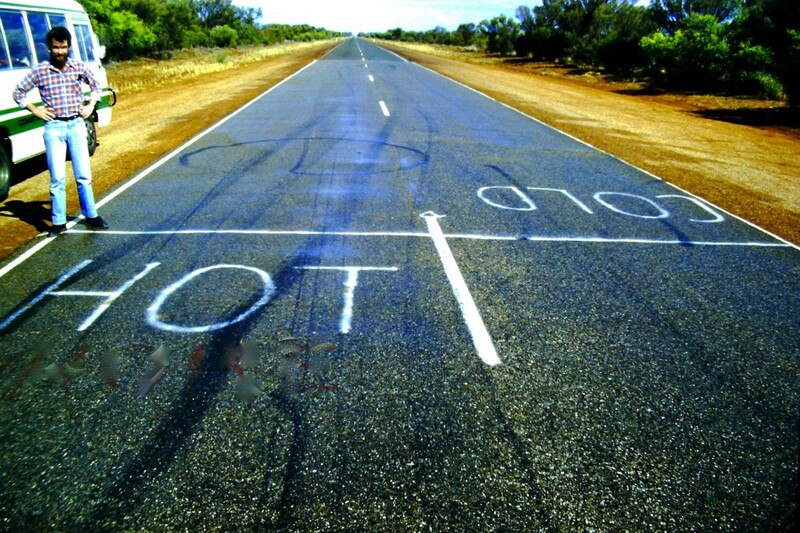 Mr. Mannell said that someone painted this "Tropic of Capricorn" line on the road. When Mr. Mannell on a 6000km journey to Uluru in Australia's center and back, they stopped when they saw is line painted on the road. Another photo of Mr. Mannell's that caught my fancy was the one of a tree with a fungi growing on it! Wow! That nose is as big as a house! He did not see the eyes on the tree that you see. He drew them to make it look like a face. This is from Mrs. Yollis' 365 blog. The post is Hack's Winning Smile! They didn't notice it when they took the picture. After they took the picture and printed it out, they suddenly noticed that Hack, the dog, was smiling! There is another photo that is kind of unusual. Some polygon! 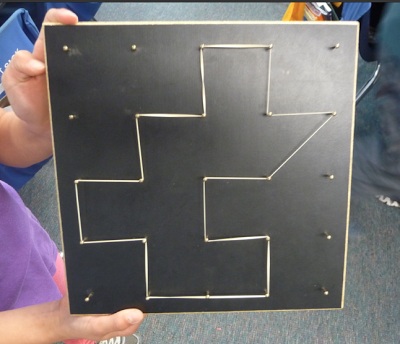 This is a "polygon" that I made in school. You might think it is not that unusual, but I think that it is unusual because a regular sized rubber band wouldn't stretch that long. Most of my classmates' rubber band snapped. Click on this to look at the post. Here is an unusual photo that I took when I was in Hawaii a few years ago. I created an illusion! 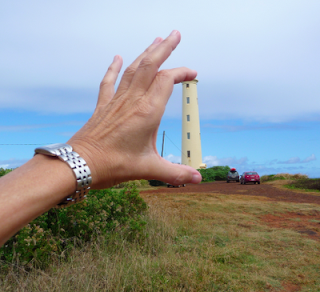 The lighthouse is not really so small that I could hold it between my fingers. Instead, I created this illusion. How do you think I created this unusual photo? Which picture do you think is the most unusual to you? I love that you have a blog! 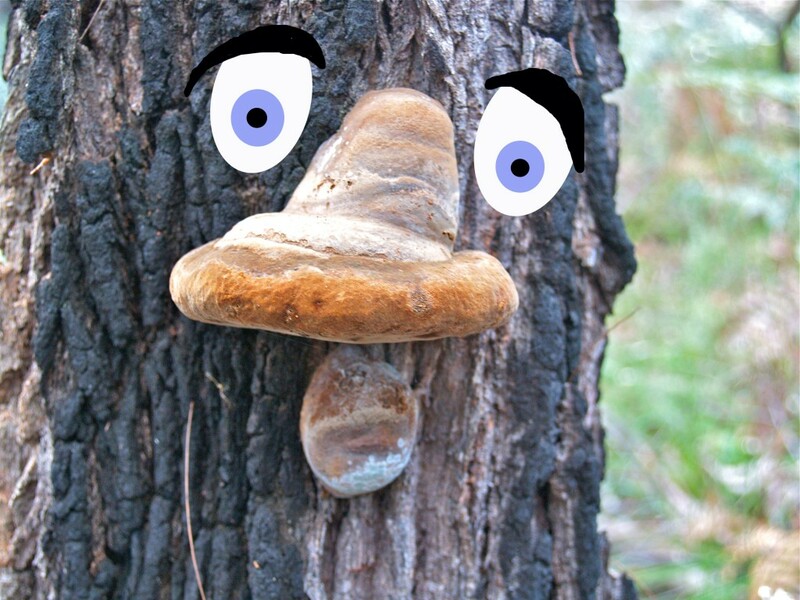 The picture of the fungi face is my favorite. Mr. Mannell is very impressive. Will you be blogging this summer? Thanks for including a couple of my photos in your interesting post. All the photos are examples of the unusual if we can see them in certain ways. The Tropic of Capricorn was someone's funny idea when the were on Capricorn. The fungi face only became a face when I thought the larger piece looked like a nose. Hack's smile wasn't noticed until looking at the photo. Your polygon was unusual because most other rubber bands failed. You managed to get the most stretch possible out of your rubber band. Mrs. Yollis's lighthouse is a trick of perspective and my favourite because it shows what can be achieved simply by taking a photo in certain ways. I wonder how many photos we have taken of ordinary things yet, if we looked again, they might be unusual? I really enjoyed this post and the compilation of everyone's unusual photos. It was hard to pick a favorite because they were all interesting for a different reason. Do you now carry a camera with you looking for interesting opportunities to snap photos? This is a very interesting post. I like all the pictures. I see that Mrs. Shipow looks like she is holding the Taj Majal, but she is actually just far away from it so the Taj Majal is smaller. My favorite photos are the Fungi Face, Hack's winning smile, and Mrs. Yollis' lighthouse. I noticed that my favorites are very similar to yours. If you had to pick, which would be your most favorite?